GROSVENOR STREET is just south of Manchester city centre in the district of Chorlton-on-Medlock. Though not as famous as Piccadilly or King St, Grosvenor St is nevertheless highly significant for a number of reasons. The street that links Downing St (the A6) and Oxford Road (A5145) has seen many changes since it was first laid out in the late 18th century. Starting off as a fashionable street of Georgian terraces, it became in the 19th century a place of factories and slum dwellings. After the war slum clearance changed the face of Chorlton-on-Medlock which became part of a new extended university campus. Walking along Grosvenor St today you'll see council-owned dwellings, a factory building, facilities linked to three universities, a sports centre, a high street bank, a former Victorian charitable institute and three pubs, converted from an old cinema, a former workshop and an original Georgian terrace respectively. WE ARE ON GROSVENOR STREET near the junction with Downing Street (A6) looking towards Piccadilly Station. The recently-built Mancunian Way flyover is visible a few hundred yards away, and beyond it to the right, the BT building. To the left of it is the newly re-modelled Piccadilly Station office building. The rest of the picture is taken up with grass and trees, now used to fill in vacant spaces left after older industrial buildings were removed. This scene as we see it here has only existed in this form since the 1970's - the flyover since the mid 1990's. Things have changed, but the basic layout and many streetnames dating from 200 years ago remain the same. WE ARE STANDING ON DOWNING ST (A6) looking towards the city centre. The eastern end of Grosvenor Street is visible on the left. This is the A6 leading south east out of the city centre towards Stockport and Hyde. For reasons which today are less than clear, this short section of road is named Downing St, which along with Grosvenor St and London Road straight ahead, have an obvious connection with the UK's capital city, some 190 miles (just over 300km) south east of here. The Manchester merchants who created these streets gave them names which reflected the their southern-leaning aspirations. Then as now, the south east of England was the more favoured and prestigious part of the country and this was the road to London. THIS FACTORY BUILDING on Grosvenor Street is one of the few structures to have survived the slum clearances of this area in the 1960's. It is now used as warehousing. Evidence of contemporary times is provided by the surveillance cameras mounted on each corner of the building. UMIST is just visible through the trees on the left. There are green-marked cycle paths on both sides of the street, though motorised traffic is only allowed to go one way - from right to left. WE ARE ON THE TOP FLOOR BALCONY OF SILKIN COURT, the council-owned residential block on Grosvenor St Chorlton-on-Medlock. We are looking north and Manchester city centre is straight ahead. The white buildings on the other side of the Mancunian Way belong to UMIST. Below us we can see the council-owned residential estate between Grosvenor St and the Mancunian Way. On the far left we of this panoramic photograph we can just see the junction with Brook Street. The BT building on London Road can be seen on the far right. Silkin Court is named after the Labour minister who oversaw the development of new housing and overspill estates in the post-WW2 years. THIS IS LITCHAM AVENUE off Grosvenor Street. These council dwellings were built in the 1960's and were renovated in the 1990's. In the distance we can see the office buildings of the city centre - Portland Tower on the left and Sunley Tower, Piccadilly Plaza centre left. The Mancunian Way runs just beyond the end of this street, not far from the meandering River Medlock, which gives its name to this district. Chorlton-on-Medlock hasn't been a township for over a century, and many people are unsure of where it is, or that it exists at all. The 20 mph speed limit sign displays the words Chorlton-on-Medlock, proving this old Manchester district does still exist, though radically changed. EWM says: Our friend Sue lives on this street - that's her washing hanging out on the line, centre right. These dwellings, currently owned by the City of Manchester council, are pleasant and very convenient for the city centre. WE ARE ON GROSVENOR STREET, next to the junction with Brook St, looking east. On the other side of the street is an attractive two storey brick building now used by students and staff of the Royal Northern College of Music. On the right is the Salvation Army's Medlock Links centre. 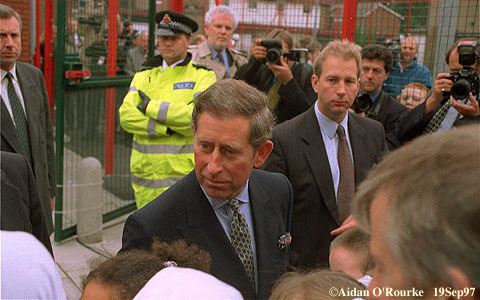 HRH PRINCE CHARLES visited the Salvation Army's community centre Medlock Links on Grosvenor Street, Chorlton-on-Medlock on 19th of September 1997. Chaperoned by hawk-eyed security staff, the prince met local residents. Here we see him moving along the crowd chatting with the people. This was one of his first official appearances after the death of Princess Diana. THIS IS UPPER BROOK STREET, at the junction of Grosvenor Street looking north toward the city centre. On the right can be seen the Mancunian Way, and just beyond it, a newly constructed apartment complex. The slip road leading onto the Mancunian way is in the centre right of the picture. On the far left is the side wall of Oddfellows Hall, now used by UMIST English Language Teaching Centre. Across Grosvenor Street is a row of houses which date from the the late 18th century, when Grosvenor St was first laid out on what was at that time countryside. This junction has changed completely from fifty years ago. Upper Brook Street is a busy dual carriageway. Only Oddfellows Hall and the Georgian terrace opposite survive from pre-1960's times.